Besieged by tourists, students and foreign residents at virtually all times of the year, Florence is one of Italy's most livable and loveable cities thanks to its manageable size, cultural vastness, culinary prowess and dizzying beauty. Florence may be a living museum, but it’s also a modern metropolis that offers to its visitors and citizens a huge spectrum of activities and centers of interest. Today a trip to Tuscany's capital goes beyond basking in the city's Renaissance splendor. Contemporary artists and photographers are claiming new ground, while the dramatic arts and music occupy a more prominent place in everyday life. Even food and fashion have soared to new heights with young chefs and designers boldly expressing their desire to move forward and deriving their inspiration from Florence's mythic past. Impossible to list the innumerable reasons why Florence has become one of the world's most beloved cities, suffice it to say that the city’s historic glory and persistent lust for life never cease to inspire and to convince us of the greatness that human beings are capable of achieving. Due to its comparatively compact size, Florence is easily navigable by foot. The city has a vaguely octagonal shape and is unevenly divided by the Arno. The larger right bank has the higher concentration of churches, major museums, monuments, boutiques, hotels, restaurants and traffic. In addition to the Pitti Palace, the Church of Santo Spirito and some other points of interest, the less-traveled left bank offers a necessary respite with the fantastical Boboli Gardens. You may want to keep this simple schema in mind when choosing accommodations. Unquestionably the most beautiful hotel in Florence — if not in all of Italy — is the Belmond Villa San Michele, located just outside the city on the peaceful hill of Fiesole. The pricey hotel has managed to preserve the splendor of the original fifteenth-century monastery in which it is housed without compromising comfort. If you prefer to stay in the center of the city but still want a similar level of luxury for a less onerous price, opt for the impeccably appointed Hotel Lungarno perched on the Arno River. The hotel's Ristorante Borgo San Jacopo is a must for romantic, Arno-side dining. Also part of Lungarno Hotels group (owned by Ferragamo), the sleek Gallery Hotel Art — along with its fashionable cocktail lounge, The Fusion Bar Shozan Gallery — is conveniently located across the river in the heart of the historic center. The fresh, modern Hotel Continentale offers simple and stylish rooms. Modern, artfully decorated rooms near the Palazzo Vecchio are reasonably priced at the Borghese Palace Art Hotel, where temporary photography exhibits are on view in the hotels' attractive vaulted lobby. For a more Florentine feel to your accommodations, choose the elegant Hotel Loggiato dei Serviti, a small, intimate hotel in a grand sixteenth-century palace. Steps from the Ponte Vecchio, the tranquil Hotel David is a warmly decorated nineteenth century villa with a decidedly homey feel. On the other side of the city, near the impressive Pitti Palace and lush Boboli Gardens, is the moderately priced Pensione Annalena. In the unlikely event that breakfast is not included at your hotel, coffee and pastries at Gilli in the Piazza della Repubblica — the largest square in the city — will do nicely. The oldest café in Florence, Gilli is renowned for is confections. 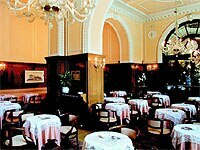 It offers both a pristine, turn-of-the-century interior complete with Murano glass chandeliers and a sprawling terrace. Take Via Roma out of the Piazza della Repubblica until you arrive at the Piazza del Duomo. You'll cross paths with the Cathedral of Santa Maria del Fiore (affectionately known as the Duomo) several times during your stay, so you may want to save this visit for later. The mastodonic marble Duomo was designed by Arnolfo di Cambio and completed in the early fourteenth century, but the characteristic dome, or "cupola," wasn’t finished until 70 years later. The refined red-tiled exterior of the dome quickly became the symbol of Florence's economic power, as it was visible from nearly every village in the surrounding Tuscan hills. 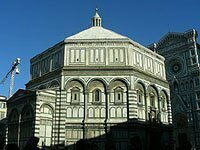 Just in front of the Duomo entrance is the Baptistry, believed to be a former pagan temple. This octagonal structure, enveloped in multi-colored marble, harbors two main treasures: the Byzantine mosaic ceiling and the "Gates of Paradise," a gigantic pair of gilded bronze doors sculpted by Lorenzo Ghiberti between 1427 and 1452. Today the splendid dome, together with Giotto's intricate bell tower, exemplifies the city's cultural richness. Before moving on to the Galleria dell'Accademia to witness the naked splendor of Michelangelo's David, have lunch just steps away on Via delle Oche at the pleasant wine bar Coquinarius. Also a short walk behind the Duomo is The Oil Shoppe, a clean and compact deli where sumptuous sandwiches are made to order and drizzled with the house specialty, fragrant extra-virgin olive oil. The homemade oil also makes an excellent souvenir. Dessert awaits at the Sicilian-style Gelateria Carabé, located on Via Ricasoli, the same street as the Accademia. What’s so special about the Accademia, in addition to its vast collection of Florentine paintings, is the long gallery of Michelangelo's unfinished works that leads to the powerful, lifelike David. The incomplete statue illustrates the pain and frustration that Michelangelo must have experienced when confronted with a "difficult" piece of marble. The young artist was not even 30 years old when he completed this huge statue for the Piazza della Signoria, where it represented for the Florentines the strength of their city and its short-lived victory over the ruling Medici family. 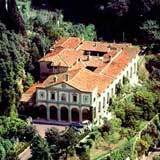 Conveniently located next to the palace, San Lorenzo was the Medici family church. It’s also the city’s oldest, at around sixteen hundred years of age. The "contemporary" building was designed by Brunelleschi and the strangely staid exterior by Michelangelo. The inside, also by Michelangelo, is sumptuous with its nave of Corinthian columns and artistic treasures (including a diptych by Filippo Lippi and bronze pulpits by Donatello). The separate Medici chapels, again done by Michelangelo, are a unique mix of stone and marble. Within the somber sepulcre, the tombs of the Medici family are decorated with strangely lifelike sculptures. Photography enthusiasts will be pleased to discover the Museo Nazionale Alinari della Fotografia, or MNAF, opened in October 2006 and located in the Piazza Santa Maria Novella. A refreshingly different way to view art in Florence, the MNAF is dedicated to the history and technological evolution of photography. While a large part of the museum is reserved for fascinating temporary exhibits, the permanent collection focuses on nineteenth and twentieth century masters, as well as contemporary artists. But the most rewarding aspect of a visit to the MNAF is the collection of rare, intriguing images of Italy and Italians since the late 1800s. If you happen to be in this neighborhood in the evening, dinner at the friendly Ciro and Sons is an excellent choice for Neopolitan pizza in a spacious, frescoed dining room. A beautiful terrace is inviting in warm weather for outdoor dining. Otherwise, wind down with a Negroni, the Florentine-born cocktail of Campari and gin that will prime your palate for dinner. (Come back at teatime for the "panforte," a Sienese sweet made with almonds, honey and candied fruits.) Weather permitting, Capocaccia, a classic, outdoor bar on the Arno, is a summer spot favored by locals. Alternatively, the smart Skylounge of the Continentale welcomes those craving cocktails on a comfy rooftop terrace complete with dreamy views of the city. Finish with dinner just steps away at the authentic Trattoria Sostanza, where the bright, old-fashioned space is as straightforward as the flavorful Tuscan fare. Or, slightly northeast, try the romantic Ristorante Rossini, where a polished brigade of cooks and waitstaff ensure a seamless experience. Young chef Alessandro Mazzoni puts together a formidable tasting menu of non-traditional, not-necessarily Tuscan creations that reflect the recent movement in Italian cuisine towards encouraging freedom of expression.